I cired for you. when will you cry for me? When there will be a day that i can no longer talk to you, that i can no longer miss you, that you can no longer be mine, My tears would flow a endless stream, and i know, When there will be a day that you are no longer mine, You will cry more than i do. അറിയാമെനിക്കിന്ന്‌ വാക്കുകള്‍ക്കു വജ്രത്തേക്കാള്‍ കാഠിന്യവും പൂവിനെക്കാള്‍ മൃദുലതയും ഒരുപോലെ വഴങ്ങുമെന്ന്‌. PS: Love reading the emotional outpourings of my heart? read the previous post and some how that post happens to be my most loved malayalam post. അറിയുന്നു ഞാന് ഇനി നീ കൂടെയില്ലെന്നു്,ഇതുവരെ ഉണ്ടായിരുന്നെന്നും. താണ്ടണം കയറ്റങ്ങളും ഇറക്കങ്ങളും തനിയേ, ജീവിതത്തില്. കേള്ക്കില്ല ഞാന് നിന്റെ വാക്കുകളും, ഒന്നും,ഏതും, ആരുടേതും. The unknown paths of life, tough or not,alone. I know this too, that I can never have again. Nor the salts of my tears, nor its glares; now. Change and changed are known well. it will be the last time for us then. PS: its all because of me, its all because of me, still confused? you might want to read the previous post as well then. 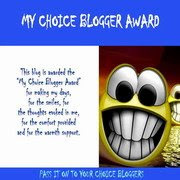 As i said in the previous post, the Obnoxious Mind has introduced the My Choice Blogger Award, also called the MCB Award. Now its time to felicitate the bloggers of the OM's Choice. Rahul Anand or Eternal Thinker, for his blogs design and support. Sneha for her awesome and thoughtful blog. Meera for the way she writes. Ayesha, for her devotion in god and inspiring posts. The Pink Orchid for spontaneity in blogging. Lakshmi akka for being the most supportive comment, and for her poems. 3.You may back link the person who awarded you by providing a link to the award image, though its not compulsory. 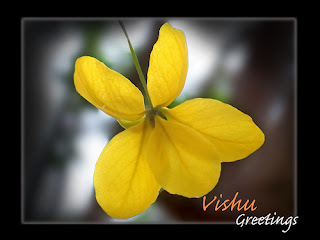 and here is the award to copy and display..
Vishu Greetings for all Bloggers. May the forth coming days bring you all, all success and fame in life, may you remain human(e) at heart, my love and sympathy prevail in your hearts, May HE shower His Blessings on you, and may you be able to transform that blessing to everybody and everything that comes to you. 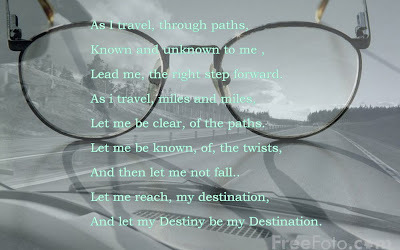 May there be a Better tomorrow for all..
PS: Dear Sweet Heart(ex), now i know what you meant to me, and what your absence has done to me, i miss you, more thane ever, i miss talking to you, knowing you, hearing you talk, the fights, the pranks, the daily diary, the smiles, the virtual hugs, the hooked up calls, Miss You Dear. : Being tagged by someone and writing that funny stuff is anyhow better than having no ideas to write and post.. Anyone hear(d) me? ഇന്നലെ വരെ എന്റെ ശരികള്‍ നിന്റേതുമായിരുന്നു. നിന്റെ ശരികള്‍ എന്റേതും. എന്നാല്‍ ഇന്നു, എന്റെ ശരികള്‍ നിന്റെ തെറ്റുകളും എന്റെ തെറ്റുകള്‍ നിന്റെ ശരികളും ആയി.. നമ്മള്‍, നീയും ഞാനും,, പിന്നീടു താനും താനുമായി.. അങ്ങനെ അങ്ങനെ അങ്ങനെ, ആ ബന്ധവും അവസാനിച്ചു.. ഒടുക്കം ആരോ പറഞ്ഞു, അതൊരു പ്രണയമായിരുന്നെന്നു. അതു പറഞ്ഞതു ഒരു ഭ്രാന്തന് ആയിരുന്നില്ലേ? പ്രണയിച്ചു പ്രണയിച്ചു ആത്മാവു നഷ്ടപെട്ട ഒരു ഭ്രാന്തന്? the wonderful smile and the wink ,first..
and i can go on and on,an endless list..
the hope, care and joy, but now? i know not..
and with these wonderful qualities, you changed my world..
the happy memories, it amazes me to no end..
and i can go on and on, an endless streak..
but now, i know, you cant be mine..
but now, i realize, that was just a day dream..
PS: I hope that you see the previous post and advice me, thank you.